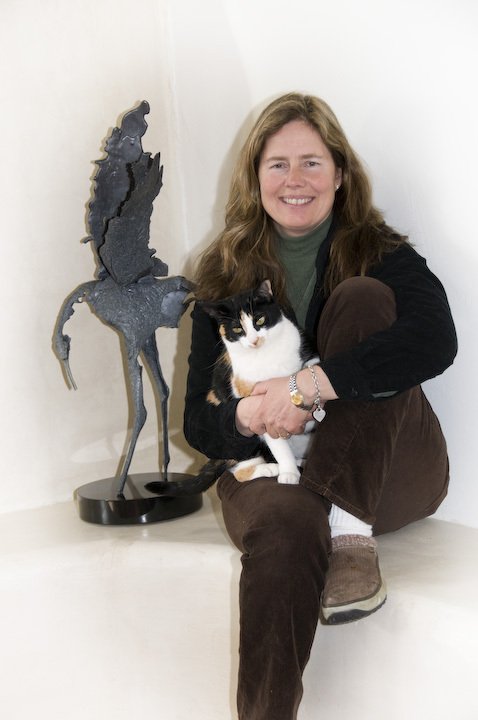 Danae Bennett Miller’s one-of-a-kind bronze sculptures are part of the cultural landscape in Bend with two public sculptures, one downtown and one in a roundabout. She fabricates each sculpture from many individual parts using a lost wax process. But rather than sculpting the wax into a model, she pours it out in slabs. The ragged slabs then become the building blocks for the sculpture. A foundry translates the shapes into bronze, and Miller adds the patina herself. Recently she has begun to add molded glass to her sculptures. Many of Danae’s sculptures are tabletop size which make acquiring one possible for all levels of collectors. See her process on this Oregon Art Beat segment. Danae has a 12 year-old son, who she raises chickens with on the ranch she runs with her husband in Tumalo.